Now that it’s chilly outside, you may be starting to trade your morning ice-cold smoothie for warmer breakfast foods. 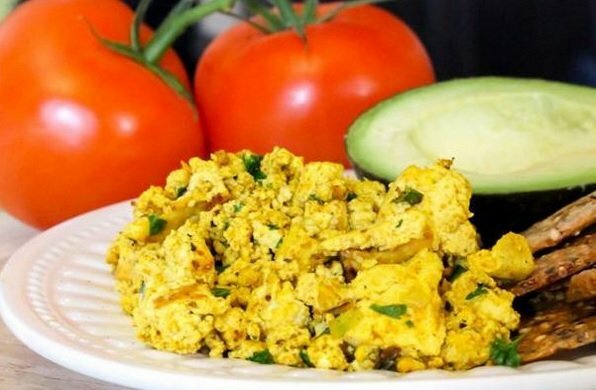 Oats are an obvious option, but if you’re looking for a more savory option, give this scrambled tofu recipe a try. Serve it with the suggested sides and toppings below, or bundle it up in a whole grain wrap for a more portable meal. This recipe is made for two serves but you can adapt it for as many serves as you want. – 1 tablespoon very finely chopped parsley. In a small bowl, mix together all ingredients for the seasoning — nutritonal yeast, turmeric, cumin, paprika, water, salt, and pepper — and set aside. Mist a frying pan with olive oil and place it over medium heat to warm up. Once hot, add the chopped scallion and garlic, and sautee until fragrant, about 2 minutes. Crumble the tofu into the pan, breaking it up with your fingers. Pour the seasoning (which should resemble a bright paste) over the tofu and mix it well, trying to color as much tofu as possible. Cook for 2 minutes or until tofu is hot throughout. Toss in the parsley and continue to stir for another 1-2 mins. Once cooked, serve with your favorite sides and toppings: Sliced avocado, whole-grain crackers or toast, sliced tomato, bacon (regular, or meat-free! ), salsa, and/or hot sauce are all great options.